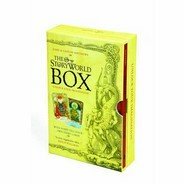 Storyworld Review: Storyworld is a story writing kit for children, that consists of an instruction and ideas book, and 40 beautifully illustrated cards. The book and cards come in a well designed box set. The cards are the chief attraction of the kit for me. Each card features a lavishly illustrated picture of a fantasy scene, or fantasy character. Many of the characters seem to be based on archrtypes. For instance, we have the king, the queen, the knight, the enchantress, the younger daughter, and the younger brother, etc. There are cards that have highly detailed illustrations of castles, labyrinths, and others which have dream like landscapes called the star blanket or the door to faeryland. The thing I liked most about each illustration was the incredible level of detail. For instance, on the door to faeryland card there is a old wooden door embedded into the side of a hill. On either side of the door are tall trees whose roots, we can see, go into the ground. The steps to the door rise up out of a pond, and in the background we can see a path that leads into the far distance to a castle. Apart from inspiring story ideas, the cards would also make an excellent oral language stimulation activity. There are a number of stories within stories on each card. There really is no limit to how many stories can be generated from each card. Also, a great idea is that on the back of each card there are several questions to help prompt students to think about each illustration in a new way. My only point of improvement about the kit, is that it doesn't supply a narrative based structure on how stories work, or a description of time/sequence and beginning/middle/end. Some students may find it difficult to structure the ideas into a narrative, even with the ample story ideas the cards will inspire.